Celia has been feeling a bit neglected this summer. My schedule is much busier than it has been in previous years so I have not had the freedom to go off on fun adventures whenever she wants. All in all, she needed a fun day so last week that is what we did. Well, we had a fun afternoon but that seemed to fit the bill. We went to the library and checked out stacks of books. Then we went to the local dog pound and looked at the dogs. Celia is on a years-long quest to convince us that she needs a dog and part of that quest involves regularly checking the pound for a dog that fits her perception of what would work for us. Only time will tell if her quest is successful. She does seem to be wearing her father down. After that, we went to Pulaski State Park in Rhode Island. The town we live in borders Rhode Island so it is much closer than it might sound, only about 20 minutes from our house. We have lived in this part of the state for eight years and have never been able to find a swimming spot that works for us. This looks like it has possibilities. It is close to home and not horribly crowded. That being said, Celia took one look at the kids playing in the water and promptly headed in the opposite direction. She said there were too many kids and it was too noisy and that if we wanted to swim we should go back in the evening when everyone would have gone home. I didn't know whether to laugh because she is so much like her parents or cry for the same reason. We ended up going for a walk around the pond. This did give her the perfect opportunity to lecture me on how much better the walk would be if we were accompanied by a dog. Celia is never one to miss an opportunity. The water by the little swimming beach was clear but the rest of the pond was covered with lily pads. They were so pretty but most of the blooms were too far out to photograph properly. The little pond above was interesting. I am not sure what it was. A cistern, maybe? I don't think you can really tell from the photo but it is encircled with stones, just like a typical New England stone wall but around this little pond instead. There are a lot of stone walls going through the woods so I know at one point this was all cleared and settled land. It would be so interesting to see what it looked like back then. The little stream was Celia's favorite part of our walk. 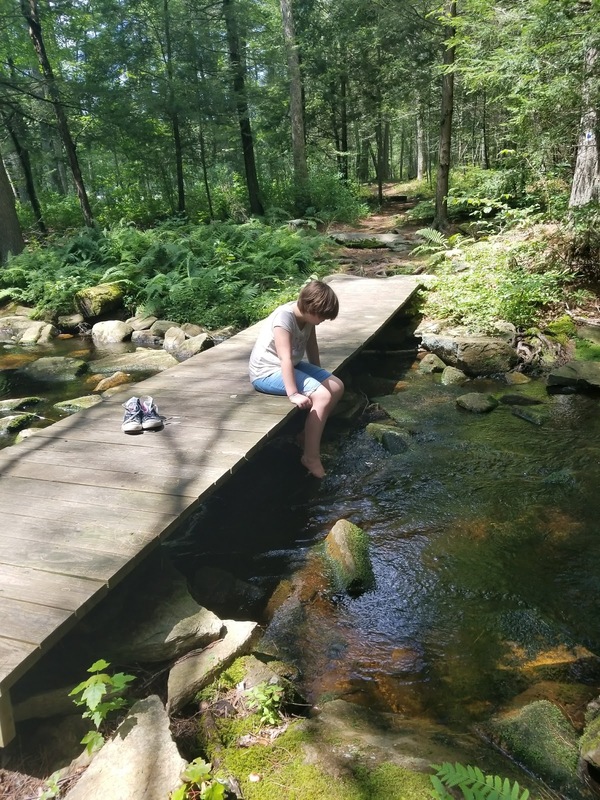 She loved the bridge and all the rocks and ferns. She has decided we need to go back with books, Nancy Drew is her choice, and snacks and then we can spend the day there. I think that sounds like a good idea though we probably should bring bug spray too. The mosquitos were out in force. We ended our day by heading home with our stacks of library books and curling up on the couch. I am sure it won't surprise you to hear that most of Celia's books feature dogs. It looks like a lovely day and a lovely park! Thanks for sharing your photos.. It was a lovely day and we will have to go back to explore more of the park. What a beautiful place, and so close to your home. I've always loved streams/burns so I'm with Celia, she sounds a character! I'm quite surprised that you manage to leave dog pounds without a dog though - my parents didn't the one time we went to one. A crazy Border collie was the upshot! We have almost ended up with a dog a few times but the pound near our house is quite small and they haven't had just the right dog yet. Celia lives in hope though.